Often considered the first modern presidential campaign, the 1840 campaign of William Henry Harrison and John Tyler included catchy slogans like "Tippecanoe & Tyler, Too! ", as well as paraphernalia which is treasured today. In 1840 the Whig party selected William Henry Harrison as their candidate for the presidency. The Whig strategy for the campaign was to present Harrison as an honored war hero emphasizing his victory over Tecumseh at the Battle of Tippecanoe. The memorable slogan of "Tippecanoe & Tyler, Too!" originated from a campaign song, "Tipp & Ty" written by a Whig supporter and sung at a Whig meeting in Ohio. The song, as well as the ideas it represented, quickly took off. Not only was the United States getting the hero of the Battle of Tippecanoe, the country was also getting John Tyler, a Southern candidate who could help overthrow the incumbent Martin Van Buren. The song also emphasized the flaws of Van Buren, portraying him as a wealthy snob who could not relate to the common people. The Democratic party chose to emphasize Harrison's advanced age, with one paper commenting "Give him a barrel of hard cider, and ... a pension of two thousand [dollars] a year ... and ... he will sit the remainder of his days in his log cabin." This counter campaign did not have desired effect. The Whigs turned the campaign to their own benefit, declaring Harrison as "The Log Cabin & Hard Cider Candidate". Unlike Van Buren who was a spoiled dandy, Harrison was a man of the people from a humble farm in North Bend, Ohio. Although Harrison had come from a wealthy family, his frontier life was successful in connecting him to the public. 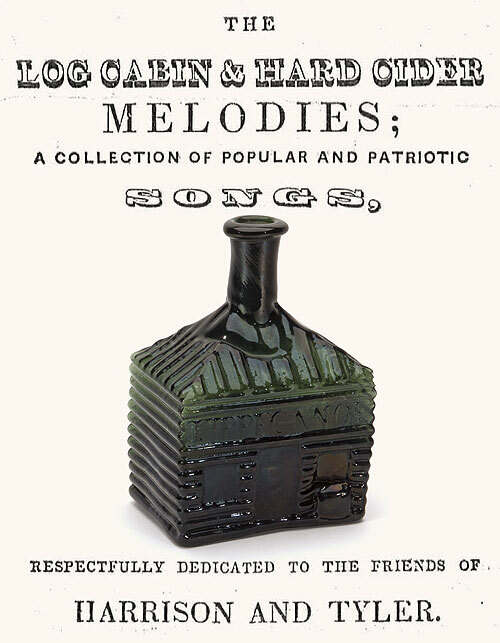 The Whig party began producing campaign paraphernalia featuring log cabins and barrels of hard cider. These items included: plates, teapots, textiles, ribbons, and the bottle pictured above. The bottle is the "North Bend" - "Tippecanoe" Historical Cabin Bottle referencing Harrison's frontier life and history as war hero. The bottle also features hard cider barrels beneath the windows. This bottle (GVII-1) and the GVII-2 mold are the only two known cabin form bottles to be used in a presidential campaign, both being used in Harrison's Log Cabin Campaign. The bottle pictured above was offered in our Spring 2015 Premier Auction 120.